Are you seeking a stress-free moving experience in Arizona? Look no further than Family Moving & Storage. 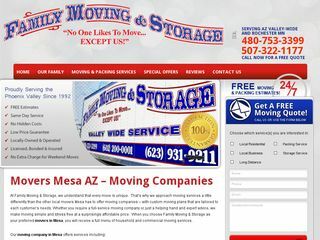 Family Moving & Storage of Phoenix, AZ can fulfill all your moving needs, whether you’re moving just across town or all the way across the country. We’ve been in the moving business in Arizona for decades, and we know the safest and most efficient routes throughout the Phoenix Valley, as well proven techniques to safely package and deliver your prized possessions. At Family Moving & Storage, we make your move an exceptional experience. We provide free no-obligation moving quotes, customized moving plans to fit your budget, packaging materials to keep your items safe, and professional service with a smile. We also never charge extra if you’ve scheduled your move for the weekend. Local Residential Moving: We know the Phoenix area like the back of our hand, and we’ll make your move a success. Commercial Moving: We promise a hassle-free and cost-effective move to get your business back up and running in no time. Long-Distance Moving: We’ll manage your move entirely in-house to ensure your long-distance move is wrinkle free, and we provide a flexible schedule to meet your timeline needs. Piano Moving: Our moving experts know to package your piano securely and swiftly. Packing Services: We’ll bring the packing supplies and manpower, and you can take a break. Storage Services: Whether you’re looking for short or long term storage options, your items will be secure in our storage facility. Family Moving & Storage is licensed, insured, and bonded according to Department of Transportation standards. Contact us today to get your free moving quote, and let us take the stress out of your Arizona moving experience.